I was hoping that Lucas might be one of the few missing children who actually did wander off and would be found. However, with the passage of three days and after reading that family members had been concerned about his safety with his dad and stepmom (they say they called Child Protective Services)....I'm still hopeful, but not very optimistic. Lucas’s stepmom told police that she took a shower and fell asleep for three hours on Saturday. She said when she woke up, Lucas was gone. Police have been searching around the area for Lucas since Saturday. They say there is no evidence of an abduction at this time. I haven’t seen the names, info or photos for the dad, stepmom, or biological mom yet. (02-19-2018, 08:43 PM)HairOfTheDog Wrote: Lucas’s stepmom told police that she took a shower and fell asleep for three hours on Saturday. She said when she woke up, Lucas was gone. Baloney. She definitely has something to do with this. That kid is so cute. Now this reminds me of another case that happened in Bellevue WA, I'm going to go look it up. You're probably thinking of little Sky Metalwala. His mom claimed she left him alone in the car because she'd run out of gas and walked to a gas station to get more. When she came back, she says, 2-year-old Sky was gone. That was over 5 years ago, maybe 6 years ago..............and still, no sign of Sky. Last year, I read a public request from Bellevue Police to Sky's mom asking for her to please start cooperating so her boy could finally be found. She won't. I think Sky's mom killed him and then dumped him somewhere to punish her husband with whom she was in a contentious divorce and custody battle. Poor baby. I hope like crazy that Lucas's case has a better ending and that he's found alive. But if he's dead, I really hope his remains are found quickly so there's a better chance of putting the person(s) who hurt him away. I believe the police are on the same page. The 26-year-old stepmother, ^ Emily Glass, has been arrested on two counts of child endangerment, Wichita police announced today. Officers and dogs have searched his home, neighborhood and the 216-acre Chisholm Creek Park. Officer Charley Davidson said Sunday that police have found no evidence that suggests Lucas was abducted, which is why no Amber Alert has been issued. Deputy Chief Gavin Seiler said the case is now considered a criminal investigation. He wouldn't detail the nature of the child endangerment charges during a Wednesday press conference, but he said Lucas is one of the children the stepmother allegedly endangered. The other is a one-year-old child, Seiler said. The child's great-grandmother Jeannie Houchin on Wednesday told the Eagle that Lucas once told her his stepmother kicked him and dragged him across the room. She said she reported the concerns to the state child protection agency, which wouldn't comment to the paper. Houchin said when she asked the boy why he didn't like his stepmother, he replied, "She's mean to me." Chief Seiler said the search for the boy continues and more charges are possible in the case. When asked whether he fears the case could become a homicide investigation, Seiler said, "We hope not." "We hope we are going to be able to find Lucas and that he is alive and well," Seiler said. State investigators and the FBI have joined in the search. Anyone with information is asked to call 316-383-4661. 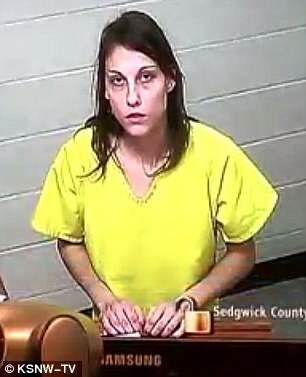 Yesterday, the stepmom, 26-year-old Emily Glass, appeared in court. She was charged with child endangerment, but Lucas wasn't mentioned. She has a 1-year-old child as well. According to the reports, the endangerment was uncovered during the investigation into Lucas's disappearance and occurred on or about 16 February. That's the day before Lucas was reported missing. She's being held on $50,000 bond. Hoping LE can get her to talk honestly while they've got her locked up. The yellow jumpsuit indicates she's on special watch, likely meaning authorities think she's a suicide risk. The court photo above isn't very clear. But, her hands look like she was in a fight or did some manual labor recently, to me. I wonder if they were beat up like that when Lucas was reported missing? Searches continue, but still no sign of Lucas. :( Police confirmed that there remains no evidence to indicate Lucas was abducted. The woman in the picture with the boy and the one up above in yellow are the same person?! I'm confused. It's the same woman Love Child. Her hair is darker and she looks ragged in the court photo. She looks like a meth head, to me. But, that's just my personal observation; I haven't heard any statements from police to indicate illegal drug use at the home. (02-27-2018, 01:32 PM)HairOfTheDog Wrote: The court photo above isn't very clear. But, her hands look like she was in a fight or did some manual labor recently, to me. I wonder if they were beat up like that when Lucas was reported missing? I see that. Surely the authorities have noted that as well. Right? Sometimes it's hard to have faith. (02-27-2018, 04:44 PM)Duchess Wrote: I see that. Surely the authorities have noted that as well. Right? Sometimes it's hard to have faith. It is getting harder to have faith in LE. Over the last couple of years, we've seen so many case of cops shooting people who turned out to be unarmed, some of whom were in no position to shoot (if they'd even had a gun) and were begging the officers not to shoot. Then, there were was the Las Vegas sheriff who hailed his deputies as heroes for getting to the mass shooter's room first and waiting over an hour to breach the room because the shooting had stopped (which turned out to be untrue). And, the Parkside Florida sheriff whose deputies failed to confront the mass shooter in the school, but doesn't consider it his responsibility. Not to mention the case of the good guy a couple of days ago who managed to wrestle the gun away from a man holding hostages in his church......... only to be mistaken for the bad guy and shot by police when they arrived at the scene. He survived, thankfully. There is a lot of room for improvement in our law enforcement when it comes to use of force, no doubt about it. Fortunately, when they don't feel their lives could possibly be in danger (as in this case), LE seems to be much more effective most of the time, in my opinion. If those turn out to really be beat up knuckles on Emily Glass, I have no doubt the cops noticed them immediately. 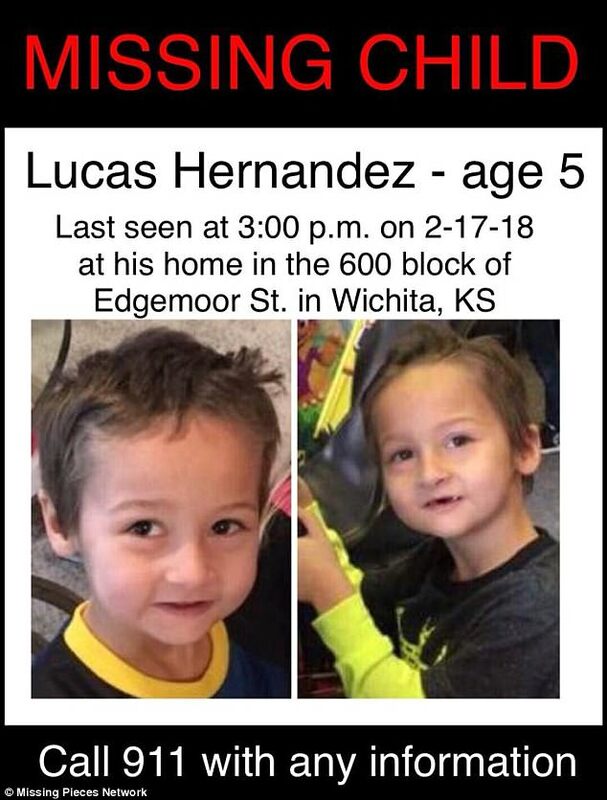 Lucas Hernandez was reported missing from his home in Wichita on February 17 by his 26-year-old stepmother, Emily Glass. Massive searches were undertaken to locate Lucas, including the use of K-9s, but came up empty. Harvey County Sheriff Chad Gay said in a press conference the body appeared as though it had been there for 'awhile'. I get the impression that LE suspects Lucas's body has been there the whole time. Hoping he's not too decomposed for an autopsy to determine a definitive cause of death. His stepmother, Emily Glass, was booked into the Sedgwick County Jail late last night for interference with law enforcement and obstruction (don't know the details of the interference and obstruction yet). A court document filed last month revealed the boy was often seen with 'bruises and cuts' on his body.The details emerged as part of another juvenile case involving Glass' infant daughter, who is now under Child Protective Services. The boy was often under care of his stepmother when his father, who has not been named, traveled for work. Lucas lived at the Wichita home with his father and was enrolled at Beech Elementary School at the time. I'm really hoping the autopsy reveals how Lucas died so there's evidence to charge stepmom with something more than interference/obstruction of the investigation. Yesterday it was confirmed by police that she's always known where to find Lucas. Police say the stepmother of a 5-year-old boy missing since February led a private investigator to a body that detectives believe is the missing child. Wichita Police Chief Gordon Ramsay said at a news conference Friday that Emily Glass showed David Marshburn where the remains were hidden, under a bridge on a gravel road in Sedgwick, about 20 miles north of Wichita. Ramsay says Marshburn contacted police. Police retrieved the body and arrested Glass on Thursday. The stepmom (dad's live-in girlfriend) who reported little Lucas missing and led a private detective to his remains months later was found dead today. Officer Charley Davidson said at a press briefing that officers responded around 1:40 a.m. after Jonathan Hernandez, Lucas's father, called to report finding his former girlfriend, Emily Glass, dead of a gunshot wound at his home in Witchita. Hernandez was away from home on business when Glass reported his son Lucas missing. Hernandez said in a statement that Glass killed herself. Officer Davidson said the official cause of death will be determined by the coroner’s office and that he didn’t know whether Glass was living at the home or who owned the rifle. Davidson did not say to whom the three suicide notes were addressed. Glass ^ had three children of her own, including the 1-year-old girl pictured with Glass, Jonathan Hernadez, and Lucas Hernandez. On May 24, Glass led David Marshburn, a private investigator hired by Lucas’ father, to the boy’s decaying remains. The boy’s body had been hidden under a culvert bridge about 20 miles north of Wichita and was covered with debris. Police arrested Glass on suspicion of lying to authorities, but she was freed. Prosecutors never charged her in Lucas’ death but said she was a person of interest. In an interview for the podcast “Crime Stories With Nancy Grace” that aired Monday, Hernandez said he no longer believes or supports Glass and that he is “a bit confused by” her release from jail. Glass's best friend and some case followers don't believe Glass killed herself. The autopsy on Lucas hasn't been released, so it's not clear if police know how he died. One thing I know................if nothing criminal occurred and you find a child dead in his bed, you don't drive the body to a secluded location, dump him under a bridge, and then make up a story about him going missing. Anyway, I think it's unlikely that Lucas died in his sleep. Hopefully, Lucas's autopsy will provide the cause of death.